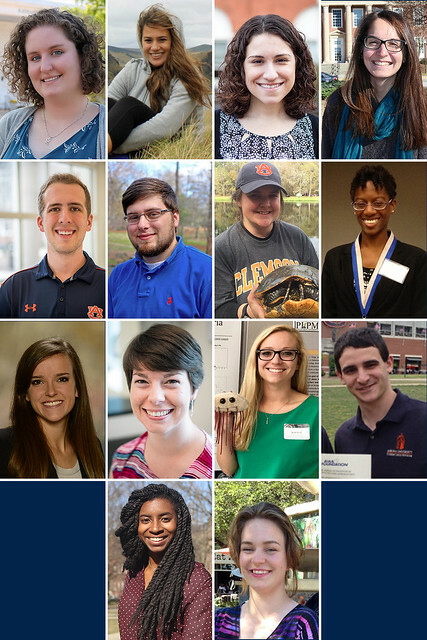 Fourteen Auburn University students and recent graduates are recipients of the National Science Foundation Graduate Research Fellowship, doubling last year’s number of awardees. The purpose of the fellowship program is to help ensure the vitality and diversity of the scientific and engineering workforce in the United States. In addition to these 14 recipients, six other students were designated as honorable mentions. Each fellowship consists of three years of support accessible over a five-year period. For each year the National Science Foundation, or NSF, provides a stipend of $34,000 to the fellow, and a cost-of-education allowance of $12,000 to the degree-granting institution. "We are especially happy to see the continued increase in the number of Auburn students being awarded this prestigious fellowship," said Melissa Baumann, Auburn University assistant provost and director of the Honors College. "While the fellowship recognizes the students by their potential for significant achievements in science and engineering research, these awards would not be possible without the guidance and support of faculty mentors." Abigail Barlett of Wetumpka, Alabama, is an Honors College senior in biochemistry within the College of Sciences and Mathematics. The title of her research is "Investigating and Inducing Oligomerization in Monomeric Peroxiredoxins" and her research advisor is Holly Ellis in the Department of Chemistry and Biochemistry. Edna Fernandez-Figueroa of St. Pete Beach, Florida, is a graduate student in the School of Fisheries, Aquaculture and Aquatic Sciences in the College of Agriculture. The title of her research is "Elucidating consumer adaptation trade-offs to multiple stressors" and her research advisor is Alan Wilson in the School of Fisheries, Aquaculture and Aquatic Sciences. Ferdous Finklea of Auburn, Alabama, is a graduate student in chemical engineering within the Samuel Ginn College of Engineering, as well as a 2013 Auburn graduate and Honors College alumna. The title of her research is "Manufacturing of hiPSC-Derived Cardiomyocytes for Drug Testing and Regenerative Medicine" and her research advisor is Elizabeth Lipke in the Department of Chemical Engineering. Jennifer Kaczmarek of Tampa, Florida, is an Honors College senior in chemical engineering in the Samuel Ginn College of Engineering. Her research is titled "Direct Encapsulation and Differentiation of Human Induced Pluripotent Stem Cells in Peptide Modified Poly(ethylene) Glycol" and her research mentor is Elizabeth Lipke in the Department of Chemical Engineering. Chandler Moore of Shoal Creek, Alabama, is an Honors College senior in aerospace engineering in the Samuel Ginn College of Engineering. His research project is titled "A Machine Learning Approach for Simulating Particle Laden Flow" and his Auburn mentor is Joseph Majdalani in the Department of Aerospace Engineering. Josh Passantino of Morris, Alabama, is an Honors College senior with a triple major in chemical engineering and biosystems engineering in the Samuel Ginn College of Engineering and Spanish in the College of Liberal Arts. His project is titled "Growing ‘Green’ Energy: Using Photosynthetic Microbes to Fabricate Bio-Photovoltaic Cells" and his research advisor is Virginia Davis in the Department of Chemical Engineering. Jenna Pruett of Bamberg, South Carolina, is a graduate student in biological sciences in the College of Sciences and Mathematics. The title of her research is "The Influence of Maternal Nesting Behavior, Nest Microhabitat, and Yolk Provisioning on Embryo Development and Offspring Fitness Across Early-life Stages" and her research advisor is Dan Warner in the Department of Biological Sciences. April Maxwell of Mobile, Alabama, is a 2013 Honors College graduate in plant sciences-agronomy in the College of Agriculture. Her research is titled "Influence of Urbanization on Nitrification and the Active Ammonia-Oxidizing Community in Grasslands." While at Auburn, her research mentor was Yucheng Feng in the Department of Crop, Soil and Environmental Sciences. Rebecca Nylen of Auburn, Alabama, is a 2016 civil engineering graduate in the Samuel Ginn College of Engineering and Honors College alumna. Her research is titled "Ultra-High Performance Geopolymer: Design, Assessment, Modeling." While at Auburn her research mentor was Robert Barnes in the Department of Civil Engineering. Elizabeth Pearce of Knoxville, Tennessee, is a 2015 chemical engineering graduate in the Samuel Ginn College of Engineering and Honors College alumna. Her project is titled "Investigating Tumor-Infiltrating T Cell Specificity to Inform Cancer Immunotherapies." While at Auburn her research mentor was Mark Byrne in the Department of Chemical Engineering. Katie Ford of Hokes Bluff, Alabama, is a 2015 chemical engineering graduate in the Samuel Ginn College of Engineering. The title of her research is "Torque generation in swarming bacteria." While at Auburn her research advisor was Robert Chambers in the Department of Chemical Engineering. Sanny Omar of Crestwood, Kentucky, is a 2015 aerospace engineering graduate in the Samuel Ginn College of Engineering and Honors College alumnus. His research is titled "Facilitating Affordable Satellite Internet Through an Aerodynamically based Attitude, Orbit, and Re-Entry Control System for Small Satellites." While at Auburn, his research advisor was Jean Marie Wersinger in the Department of Physics. Tekisha Rice of Lipscomb, Alabama, is a 2015 human development and family studies graduate with the College of Human Sciences as well as an Honors College alumna. Her research is titled "Relationship Maintenance among Incarcerated Individuals and their Partners: Implications for Commitment and Satisfaction." While at Auburn, her research mentor was Francesca Adler-Baeder in the Department of Human Development and Family Studies. Audrey Rose Gutierrez of Commerce, Georgia, is a 2015 electrical engineering graduate in the Samuel Ginn College of Engineering and Honors College alumna. Her research is titled "Light-field Detection using Graphene Photodetector Arrays." While at Auburn, her research mentor was Mark Adams in the Department of Electrical and Computer Engineering. Aerospace engineering graduate student Cassandra Jones, chemical engineering graduate student Chelsea Harris, physics graduate student Miles Blanchet, industrial engineering and Honors alumna Amanda Chu, psychology alumna Darcy Corbitt-Hall and cellular and microbial graduate and Honors alumnus Tyler Rice. The National Science Foundation Graduate Research Fellowship program recognizes and supports outstanding graduate students in NSF-supported STEM–science, technology, engineering and mathematics–disciplines who are pursuing research-based masters and doctoral degrees at accredited U.S. institutions. More information is available online, or contact Paul Harris at paul.harris@auburn.edu or Ken Thomas at kdt0011@auburn.edu in the Honors College. Fourteen Auburn University students and recent graduates are recipients of the National Science Foundation Graduate Research Fellowship for 2017. Top row left to right: Abigail Barlett, Edna Fernandez-Figueroa, Ferdous Finklea, Jennifer Kaczmarek. Second row left to right: Chandler Moore, Josh Passantino, Jenna Pruett, April Maxwell. Third row, left to right: Rebecca Nylen, Elizabeth Pearce, Katie Ford, Sanny Omar. Bottom row left to right: Tekisha Rice, Audrey Rose Guiterrez.